"In the hot evening teen-age gangs moved restlessly through New York City's streets. Police patrols watched warily for signs of juvenile trouble that becomes a boiling threat each midsummer. Suddenly last week violence broke out in three scattered sections of the city. On Manhattan's upper West Side a youth was fatally stabbed and his friends critically wounded. 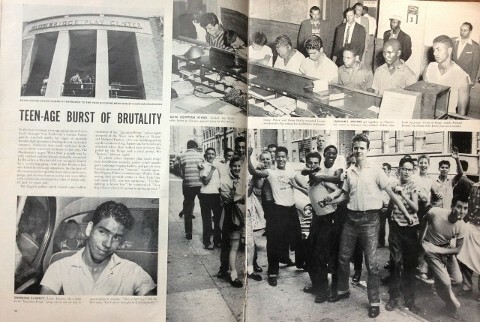 In Brooklyn a 16 year old was savagely beaten by a wandering gang. And in the Bronx a boy was killed by teen-age attackers. In the heat of the tension policy quickly bore down on known gangs, and station houses in the city were filled with solemn-faced suspects, some of them only 12 and 13 years old. The biggest police catch found some sullen members of the "Egyptian Kings" (above right) accused of the West Side killing of 15-year-old Michael Farmer, who was handicapped by a polio-weakened leg. Farmer and a friend were attacked when they walked into territory disputed by the Kings and a rival group, the "Jesters" (bottom right). To check other disputes that could erupt into murderous assaults, police youth squads gave warnings to gang leaders, and patrols were heavily increased to "saturate" trouble spots. But Deputy Police Commissioner Walter Arm, nothing that juvenile crime in New York City had risen 41%, was not optimistic. "It's like fighting a forest fire," he commented. "You don"t where it's going to spring up next."